The more we look at the Google I/O schedule that was posted today, the more information we discover about upcoming features and products. After learning that the ATAP team is going to give us new wearables and that Android M will be around in some capacity, we found another feature called “Voice Access” that might help you control apps in new ways, namely, your voice. Google plans to highlight simple steps for developers to follow in order to provide an “optimal experience” within apps using this new Voice Access service. That makes it sound like this isn’t just a way to launch an app with your voice, but is also a way to control aspects of it, something we haven’t seen in the past. 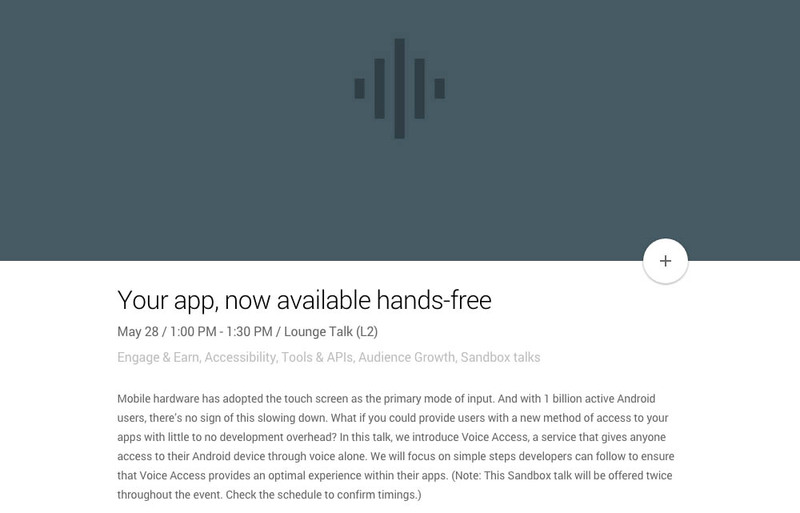 Google clearly thinks this new Voice Access service is a big deal, as they are running this session twice during Google I/O. You tell me, have you been wanting more control over your phone via voice?